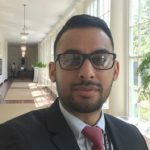 Eiman Behzadi is a Program Analyst in the Department of the Treasury’s Office of Investment Security, which chairs the inter-agency Committee for Investment in the United States (CFIUS). While at Treasury, he also served as an Intelligence Specialist in the Office of Terrorism and Financial Intelligence focusing on Intelligence Operations. Eiman is also a former active duty Intelligence Analyst in Special Forces Group, utilizing his proficiency in Arabic, Farsi, and Dari to assist SOF missions in the Middle East and Africa regions. Eiman holds an M.S. in Terrorism and Public Policy from the School of Public Affairs at American University, B.A. degrees in Cognitive Psychology and Cultural Anthropology from the University of California at Irvine, and an A.A. in Arabic from the Defense Language Institute Foreign Language Center. Eiman will begin his M.B.A. at the University of Virginia’s Darden School of Business in August 2017.